Newly founded, the Chesapeake Jeep Association is an Eastern Shore of Maryland club focused on four wheeling. We promote the four-wheel drive sport, advocate responsible off-roading, and inform our community about current land issues we face today. Join us on a trip, or meet & greet and learn what it's like to share the trail with some of Maryland's most adventurous four wheel drive enthusiasts. What can you expect from the Chesapeake Jeep Association? The Association is made up of a growing group of individuals who enjoy 4x4ing. You will find a wide range of experience, from beginners to advanced four wheelers. 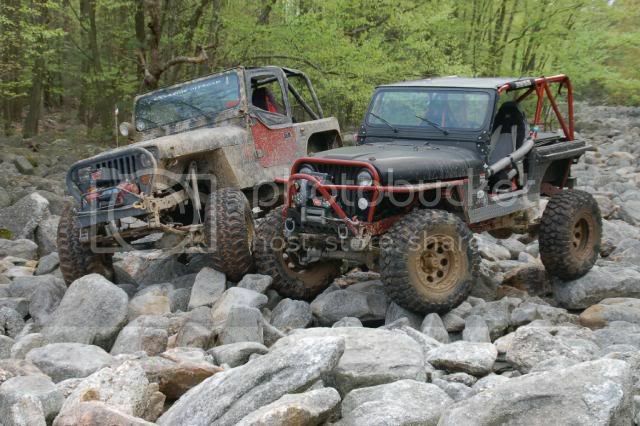 Several of our members have participated in rock crawling competitions, earned merit as Tread Lightly! Trainers and worked as trail guides for Camp Jeep offroad events. We are based on the upper Eastern Shore of Maryland, but anyone in the Chesapeake Bay region is welcome to join. well as cut some new ones. Stay tuned for more information . . .
in Chester near the Kent Narrows Bridge. weekend. Several members will be heading up early to set-up camp. fee to ride on the property. anything else, please do not hesitate to ask. Our next Meet and Greet has been scheduled for June 12, 2011 at 3:00 P.M. The meeting place will be the McDonalds in Centreville. For those of you that are unfamiliar with the area the address is posted below. During this Meet and Greet we are going to attempt to plan a trail cleanup date for our Kent County property as well as discuss upcoming events / trailrides. We will also have long and short sleeve t-shirts for sale. This weekend (July, 16-17th), PAJeeps puts on their annual 'Jeep show' in York, Pa. This includes everything from an offroad course, vendor area, swap meets, and a show and shine. A fee is necessary to visit the show, so check out the link below for more info. A few members are heading up on Saturday. Sunday, July 17th, Some members are heading to Rausch Creek Offroad Park to hit some of the trails and visit the new Northeast side of the park. There is a fee involved to visit the park. Also, Rausch Creek Offroad Park has some requirements for your vehicle necessary to travel on the trails. We will be having another local get together later this month, so keep checking back for updates.